The astronaut breathed in and out, clinging to that most basic of human motions. He’d fallen face down in the dark, red sand. His arms and legs spread out on both sides. Scratches, dents and a fine coating of red dust covered his grey suit. He looked at the oxygen readout on his arm panel: 10% and falling. Johnson turned over and moaned. His children had dropped him off about a year ago, an “early Christmas present.” He “wouldn’t have to take care of that big old house anymore.” They forgot to ask if he wanted to. Sure, they visited, but only when it suited them. He’d always thought of himself as a doting father. He’d spoiled them with little gifts and sneak them a sweet when their mother had sent them to bed without supper. But they didn’t return his favor. They left him to rot. He understood why they’d done it. He’d thrown a plate at the dog, yelled at his daughter, and raised a hand to his grandson. Clearly symptoms of greater ills, not the grouchiness of an old man sleeping on a sofa. The young never did know what to do with the old. His year inside had been as lifeless as the faces around him. His health had steadily declined. The stroke and the need for an oxygen tank made him certain he’d never get out of there. Dave had come along about two months ago. He always wore a dopey grin and lurked around every corner. “Come on, Mr. Johnson. Those legs’ll stop moving altogether if we don’t get up and at ‘em.” Dave opened the curtains wide. Johnson recoiled at the light. He still lay on his side facing the window, but covered his eyes with his hand. Dave walked around the bed. He got a good handful of Johnson’s side and forced Johnson up into a sitting position. 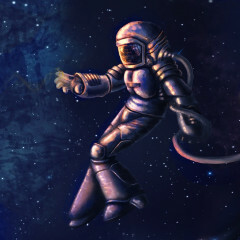 The astronaut walked a mile without seeing signs of life. No footprints marred the sand save his own. No plants or trees or animals dotted the dark, red sands that surrounded him. Jagged stones the size of booster rockets lay to one side. In the distance a range of mountains stood majestic and impenetrable. Synopsis: The astronaut crashes. Johnson crashes into a nursing home. Dave would shove Johnson into the shower and scrub him in uncomfortable places until his skin reached a ruddy hue. The astronaut lived through the crash, flying from the rocket, and skittering to a halt in the dry sand. His entire body ached. He cracked a rib in the “landing” and labored to breathe. He turned himself over and stretched up to see the crash site. A fireball erupted from the wreckage, dashing any hope of supplies or calling for help. Dave ushered Johnson into a convenience store. “You want a hot dog, Mr. Johnson?” He asked as he took Johnson’s wallet from Johnson’s pocket. Johnson didn’t reply, but stopped at the hot dog machine, staring at the spinning meat. He wondered if burning his face on it would make his life better or worse. “You don’t want the usual?” she asked. The girl laughed as if this were hilarious. Johnson shook his head with rage. He looked at Dave and willed him to stumble. Willed him to say something inappropriate, to get slapped, or burst into flames. But the girl kept giggling. With steadier steps than he’d had in years, Johnson walked toward the door. Synopsis: Dave takes Johnson on a "constitutional"
Warning lights blinked like a frenetic traffic signal. Alarm bells whistled and sang. Pulling on the steering column did nothing. The nose of the rocket took on a red glow as it split the atmosphere. The ground grew ever closer. Bits and pieces of the ship snapped off, dissolving like sugar cubes in hot tea. The astronaut put his helmet on and fumbled for the locking mechanism. The red ball that had flirted with his hopes from ten thousand miles away now sought to swallow him whole. Dave threaded his way through pedestrians and street vendors. He mumbled about his job, muffled further by the cigarette between his lips. Cars honked and drivers yelled as Dave ran into the street to catch up. Johnson turned the next corner and ran as fast as he and “Oxy” could manage. At every corner, he turned; never seeking a path or knowing one. He ducked into an alley and collapsed behind a dumpster, out of sight. There in the distance the astronaut saw a speck, a faint red glow. His eyes could play tricks on him, giving hope where there was none. He checked the scopes. It was there, shining red and somehow in his path. Had they known? Had they sent him there? He tapped the fuel gauge. The needle didn’t move. In his haste to lose Dave, he lost sight of everything familiar. He’d grown up in this city, but so much had changed. Hehad changed. The streets were wider and narrower. The buildings were older and newer. He looked for something familiar, but hoped he wouldn’t find anything. At one intersection, he came to a park. Kids ran and played. Nannies looked on from park benches and discussed the latest gossip. He paused and watched them, breathing in their youth, breathing in their joy. The astronaut woke up in a small rocket. His brain felt like static. He remembered a family gathering or party or something. How long ago was that? Hours? Days? The gauges and controls meant little to him. He’d seen them before but only in the way everyone from an earlier era had seen an airplane’s cockpit. Something fell out of his hand. He reached down and picked it up: a locket. In it were pictures of his children. He closed the locket. The children were gone, along with the nannies and mothers and their disapproval. Hours had streamed by while Johnson stood like a statue. Then with the creakiness of a long unused car, he drifted past the empty playground, then past the games of ultimate frisbee, and the midday joggers. He wandered down one path and up another until he’d left everyone behind. Mrs. Dinkle across the hall, Dave, his children, all the people, evencivilization faded away. He walked up a slope toward a hill that overlooked the park. As he walked he pulled the oxygen tube from under his nose. He breathed heavily. He dropped “Oxy” and jiggled himself free from the tubes. At the top of the hill he huffed and puffed until he fell face down in the green grass. He spread his arms wide, brushing aside fear and guilt and the past. He justbreathed. Synopsis: Johnson makes a break for it.